Texas’ senate just passed a bill to ban all abortions prior to the 20th week of pregnancy, approximately four weeks earlier than the guideline set by Roe v. Wade. The bill gained momentum largely by way of a disputed claim that a fetus can feel pain as early as 20 weeks (see article on controversy here). Among other consequences, the new law, which requires a facility upgrade for clinics not meeting outlined surgical standards, will effectively shut down all but a few abortion clinics in the state (a state, by the way, with one of the highest teen pregnancy rates in the country). The bill has created quite an outburst across Texas and the U.S., with Senator Wendy Davis emerging as the outspoken hero of the “pro-choice” movement (she successfully thwarted the the bill’s first attempt at passage during a 13 hour filibuster). All the hullabaloo prompted me to revisit Carl Sagan and Ann Druyan’s 1990 article in Parade Magazine, “Abortion: Is it possible to be both ‘pro-life’ and ‘pro-choice’?”, which is still the most thoughtful, level-headed discussion of the issue I have encountered. After reading, you may begin to see why defining the ability to feel pain as the metric for fetus viability stands on quite shaky moral ground. 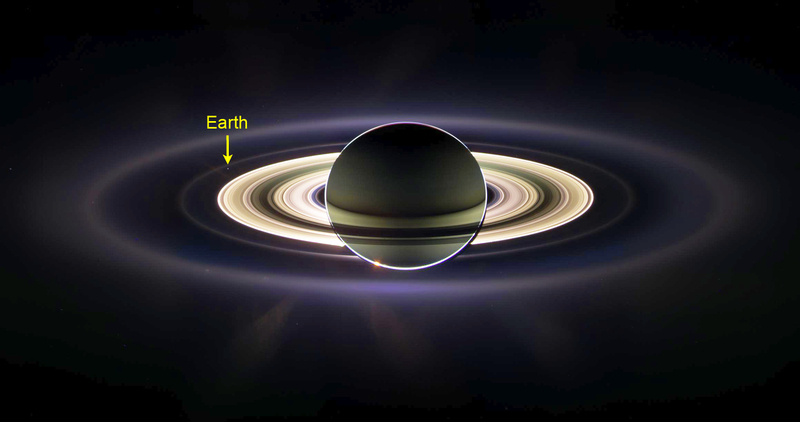 You might be familiar with Carolyn Porco’s 2007 TED talk, in which she introduced the world to some truly breathtaking photos taken from the Cassini robot spacecraft (launched in 2007). Well, Cassini is still up there, and on July 19th (from 4:27pm-4:42pm CST), it will be snapping another high-res photo of Saturn that is once again expected to feature earth in the backdrop, though this time in natural color. This will be the first time in history the people of Earth have known in advance their picture is being taken by a spacecraft millions and millions of miles away. To celebrate, Porco and the Cassini team are encouraging people to spend a few moments outside during the actual photo time (you can look that up for your local area here) to reflect on and celebrate our existence, and to maybe even smile or wave for the camera. The event is officially titled, The Day the Earth Smiled. Can an atheist’s favorite song be about Jesus? I’ll tell you that’s all . . .
– can you find that song appealing, they ask. Well, the short answer is that it’s beautiful. Phillips’ voice, the instrumentation, the melody, even the scratchiness of the recording all add up to a truly moving aesthetic experience – an experience unhindered by any disagreements over the lyrical content. Beauty, whether expressed through a painting, a song, or a play, is available to everyone, not just to those of a particular faith. You’ve probably seen Richard Dawkins hold back his frustration when asked how he can appreciate Christian-themed literature or music – “it’s like saying I can’t appreciate a work of fiction because I know the characters are made up,” he’ll usually respond. Good art is good art, good music is good music – it matters little what inspired the creator, so long as she was inspired. Fast forward to 2013, and Steven Pinker is no longer just some guy to me, but one of the world’s most interesting thinkers. He is currently a professor of psychology at Harvard, and has raised his profile over the years with public advocacy of science (you may recognize him by his locks – his hair has its own facebook fan page) and a string of best-selling books on language and cognitive psychology. His most recent work, The Better Nature of Our Angels, was hailed by Bill Gates as one of the most important books he’s ever read. The reference to “igon values” is a stab at Gladwell’s sophomoric misuse and misspelling of linear algebra’s “eigenvalue”. Gladwell fired back in a response, and the two ended up in a bit of a written exchange over, of all things, football statistics. But the lesson here is even more important than those I’ve remembered from Blink. Social science is a tricky business, with vast amounts of room for error in interpretation. We have to be careful accepting conclusions based on anecdotal evidence, and especially of trusting individuals writing or speaking far outside their area of expertise. The other lesson is to read often and read widely. My first bit of disillusionment with Gladwell actually came a few years ago, while simultaneously reading The Tipping Point and Dubner and Levitt’s Freakonomics. Both books, in what I assume was a coincidence, tried to answer the question of why crime rates had dropped so suddenly in New York City in the mid-90’s. I won’t spoil the conclusions for those who haven’t read the books, but let’s just say they were radically different, and it seemed clear to me that the take in Freakonomics was much more likely (and was backed up by much more data). That’s not to say Gladwell doesn’t have much to offer (it’s also not to say that Pinker is infallible or should be read without some degree of skepticism either). I would agree with Pinker’s back-handed assessment of Gladwell as at least a “minor genius” with a unique voice and take on the world (though I’m not sure I agree with his take on the future of religion, here). In summary, I very much look forward to the next release of a Gladwell book; though this time I’ll know to spend more time savoring the prose than conclusions. I’m really not sure what Ball State is thinking. In the middle of a controversy over professor Eric Hedin’s alleged Christian proselytizing in a science course (see earlier post here to catch up), they have now gone and announced the hiring of Professor Guillermo Gonzalez, a vocal Intelligent Design advocate, in their department of physics and astronomy. All I can say is that if I were 17 or 18 years old and considering a career in science , this would send a clear message to me that BSU is not the place to apply. I think they are in real danger of developing a reputation as a fringe science institution, and that is going to hurt the university and the state of Indiana (my home state, by the way) in the long run.